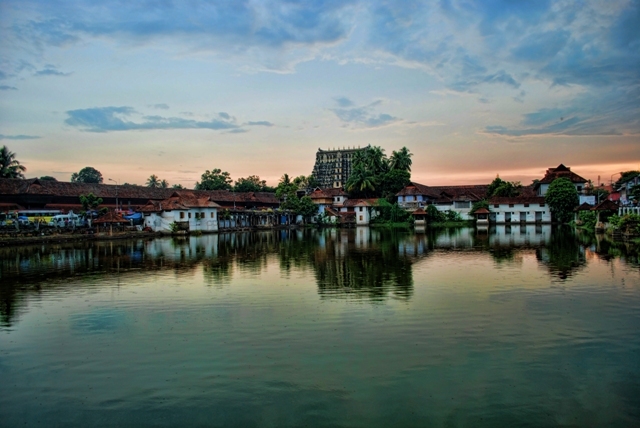 Padmanabhaswamy temple is one of the most ancient temples in Kerala. Chief deity of the temple is Lord Vishnu in His "Anantashayana" posture. In the Anantashayana posture, Vishnu sleeps on his attendant serpent "Ananta" floating over the cosmic ocean and being served by his wives. Padmanabhaswamy temple is located at East Fort in Thiruvananthapuram ( Trivandrum) - the capital city of Kerala. Some of the ancient scriptures from the temples indicates that the core temple was built in the year 1376 by King "Aditya Varma Sarvanga Nathan" and later the temple became the chief deity of the "Venadu" royal family. There is a legend behind the founding of the temple and it is described in the "Ithihyamala" - a great Malayalam book which collates all folklore of ancient Kerala. There was a sage known as "Vilwa Mangalam Swamiyar" he was in close relationship with Lord Krishna in the toddler form. Krishna used to play with "Vilwa Mangalam Swamiyar". Once the sage got angry over the unruly behavior of infant Krishna. Krishna was sad and left and went to a nearby jungle known as "Anantan Kaadu". The sage was heart broken. He begged for infant Krishna to return, in turn Krishna told the sage to come to the jungle if he wish to see him. The sage followed the direction and there in the jungle he found Krishna in his original form of Vishu, as lying on the serpent Ananta. It is believed that at this place the Padmanabhaswamy temple is built. In recent times Padmanabhaswamy temple rose to fame as a huge treasure was found under the temple and hence forth the security check in the temple is enhanced. The main festivals celebrated in the temple are Ganesh Chathurthy, Ashtami Rohini, Thiru Utsavam, Kalabham etc. The main festivals are celebrated in the months of April-May and also during August-September. *The timings given here are for ordinary season. The timings may change during the festival occasions. Please visit the temple's website to know about the darshan timings.